Ever since the Insurance Institute For Highway Safety began subjecting vehicles to its passenger-side small overlap crash test in 2017, it’s been a hard one to pass. Pickup trucks are no exception. On Thursday the IIHS reported that, after testing 11 crew cab pickups, only three managed to nail a Good rating. They are the Ford F-150 and the Nissan Titan, which join the Ram 1500 (models built after last July), which earned the rating in late 2018. 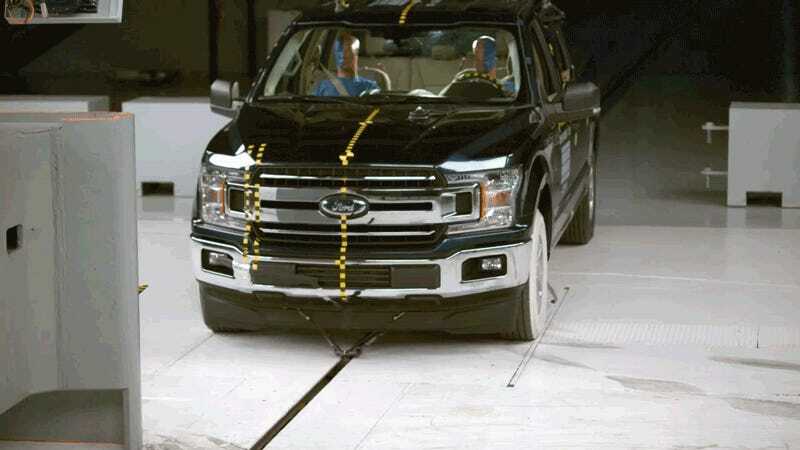 In particular, the IIHS praised the F-150 for its structure that held up well. Maximum intrusion into the cabin was five inches “at the rightmost section of the toepan,” and the seat belts and airbags “worked well together to control the movement of the passenger and driver dummies.” Neither of the two dummies were recorded to have potential injuries. The Tundra was found to be “seriously compromised by intruding structure.” It reportedly had 15 inches of maximum intrusion at the rightmost part of the toepan, as well as over a foot of intrusion at the lower door hinge pillar. “The passenger dummy’s head hit the grab handle attached to the A-pillar as the A-pillar intruded into the passenger’s space,” the IIHS wrote. “Measures taken from the dummy indicate that injuries to the right lower leg would be likely in a crash of this severity, and injuries to the right hip would be possible,” it went on. We have reached out to Toyota about the results of this test and will update if we hear back. 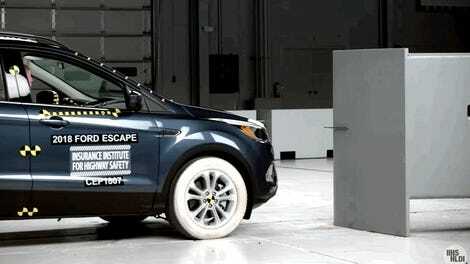 The passenger-side small overlap crash test has a car’s rightmost 25 percent frontal width hitting a wall at 40 mph. 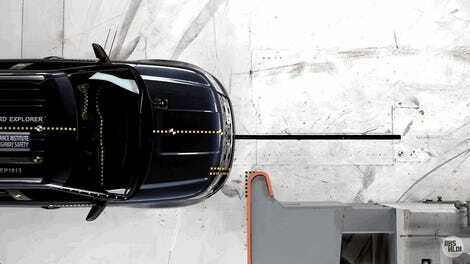 The IIHS used to only test the driver’s side in this manner, but recently began testing both sides as it found that some carmakers neglected to provide the same protections on both sides of the vehicle. The agency also notes that pickups have, overall, taken longer to score well on the driver-side small overlap crash test, so “it’s no surprise that they are lagging a bit in the newer passenger-side evaluation.” Additionally, because pickups tend to weigh so much more than smaller cars, crash damage from a fixed barrier might be more severe. 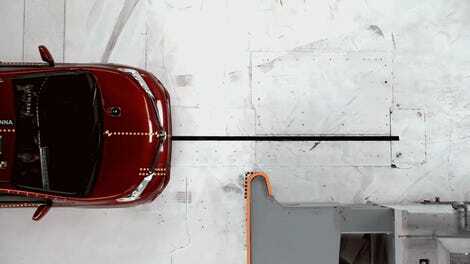 We are proud that Toyota and Lexus vehicles perform well in both the IIHS and NHTSA crash testing. To date, IIHS has awarded two Top Safety Pick (TSP) and three TSP+ ratings to Toyota’s 2019 line up and our NHTSA NCAP ratings include 27 Toyota and Lexus models with 5-Star rating in our 2018 line up. We put the needs of our customers first and the quality, safety and reliability of our vehicles is a top priority - and with continuous improvement being at the heart of everything we do - we’ll continue to look for ways to improve in an effort to exceed customers’ expectations – particularly in new testing such as IIHS’ passenger-side front small overlap for pickup trucks.